We live in a day and age where we expect instant gratification. You are hungry, you go through a fast food drive thru or zap something in the microwave for 3 minutes. You send a text and expect the person to respond within a few minutes. The same goes for email, since you should be in front of your computer and smart phone with access to your email at all times. Although the world works in such a way, there are many facets of the world that still work at a snails pace. Have you ever applied for a job, and never heard back from them? Had an interview and taken weeks to hear back from them? I think the worst we have heard is someone applied for an Executive Pastor position and received a letter 7 months later that they did not get the job they applied for. You think? Although you need to make sure that the candidates that are applying for the position you are hiring are a good fit, there is such thing as common courtesy. Here are 3 ways can make sure the candidate knows you are thankful they took the time to apply for your position. This day and age, most applications are completed online. There is a way to enact an auto response in most cases where you can personalize the email to state their name. In the instance that you have candidates mail in their application and supporting documents, have a form email that can be sent by one of your assistants. The email can be short and sweet, but at least the candidate knows the application was received. If you look over a candidates application and you know right away they aren’t a good fit. Tell them. They may not like being told no so quickly but at least they aren’t left hanging for 7 months wondering if they will get a call. Ok, if they are still waiting for a response after 7 months common sense might be lacking. When you know you have the person for the job, let all of the other applicants know. The pastoral interview process is a longer process than most business jobs. As you narrow down the candidates to your final three, then two, then one, let them know they are no longer being considered. The bottom line is as people take time to apply for a position at your organization, in return you should value their time. They might not be a good fit for you now, but you never know how situations might change in the future. 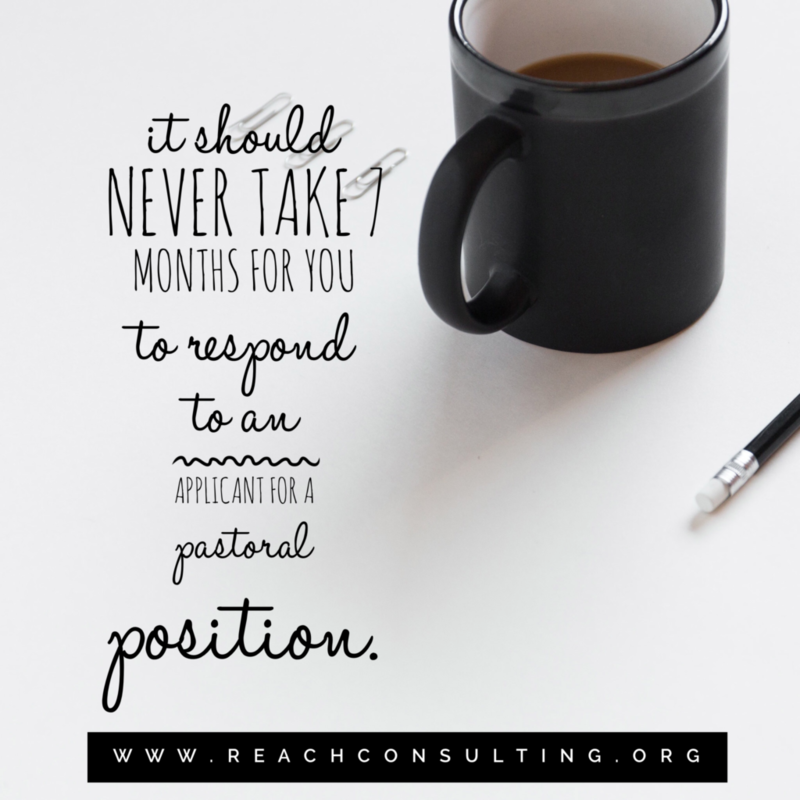 And by all means, don’t take 7 months to respond to an applicant’s initial application. What is the longest time you have waited to hear from a potential employer? Can you beat 7 months?